The global market for bioadhesive has been gaining significantly over the recent past. Thanks to the increasing implementation of stringent rules and regulations, compelling industries to limit the application of petroleum-based products, the focus on eco-friendly, bio-based adhesives has increased, which is reflecting greatly on this market. The technological advancements in research and development activities and the resultant advancements in adhesives is also supporting the adoption of a variety of bioadhesives across the world. Going forward, the increasing entry of new vendors in this market is likely to back up its growth over the next few years. As per Transparency Market Research (TMR), the global market for bioadhesive, which stood at US$251.6 mn in 2015, is anticipated to rise at a healthy CAGR of 12.90% during the period from 2016 to 2024a and is projected to increase to US$736.0 mn by the end of 2024. The global market for bioadhesives is broadly analyzed on the basis of the source and the end user. Based on the source, the market has been classified into plant-based bioadhesives and animal-based bioadhesives. Among the two, the animal-based bioadhesive segment led the global market in 2015 with a share of nearly 80%. Researchers expect it to continue like this over the forecast period as well on the ground of the rising utilization of these adhesives in the medical and healthcare industry for specialty applications, such as open surgeries and wound closures. By the application, the market has been categorized into the paper and packaging, medical, personal care, wood works and furniture, and the construction industries. With a share of more than 30%, the paper and packaging industry surfaced as the leading consumer of a varied range of bioadhesives in 2015. Over the coming years, the industry is expected to continue as the key end user of bioadhesives, thanks to the steady rise in the global packaging industry. Geographically, the worldwide market for bioadhesives is led by Europe. In 2015, the European market accounted for more than 35% of the overall market, thanks to the increase in the construction activities. Over the forthcoming years, the regional market is likely to remain dominant on the grounds of the high demand for bioadhesives in several industries, such as construction, packaging, and wood works and furniture in this region. Germany is anticipated to emerge as the leading consumers of bioadhesives in Europe in the near future. Apart from Europe, North America is also expected to display lucrative growth opportunities for the market for bioadhesives. The rising implementation of stringent norms and policies concerning the usage of petroleum-derived products in this region is likely to boost the North America market for bioadhesives in the years to come. The development of novel products with efficient adhesive properties is also projected to provide momentum to the North American market over the next few years. 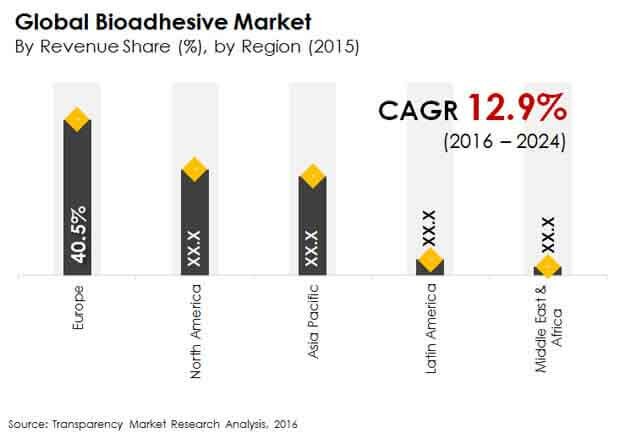 Adhesives Research Inc., 3M Co., SCION, Adhbio, Bioadhesive Alliance Inc., Meredian Holdings Group Inc., Ecosynthetix Inc., Ashland, Cryolife Inc., and Henkel Corp. are some of the key players operating in the global bioadhesive market. Bioadhesive is an adhesive that is derived from natural sources such as plant and animal. It is a substitute for synthetic and epoxy adhesive that are derived from petroleum. Bioadhesives are primarily employed in end-user industries such as paper & packaging, construction and wood works & furniture. Demand for bioadhesive is expected to increase significantly in the next few years considering the stringent regulatory policies regarding petroleum derived products and growth of the end-user industries. Europe dominates the bioadhesive market in terms of production and demand. Countries such as the U.S, Canada, Germany and UK are expected to be the key consumers of bioadhesives. Low shelf-life of bioadhesive is anticipated to hamper market growth. This factor is projected to adversely affect market growth during the forecast period. Increase in research activities on bio-based products is estimated to offer major opportunities to the bioadhesive market in the next few years. This report analyzes and forecasts the market for bioadhesive at the global and regional level. The market has been forecast based on volume (kilo tons) and revenue (US$ Mn) from 2016 to 2024, considering 2015 as the base year. The study includes drivers and restraints of the global bioadhesives market. It also covers impact of these drivers and restraints on demand for bioadhesive during the forecast period. The report also highlights opportunities in the bioadhesive market at the global and regional level. The report includes detailed value chain analysis, which provides a comprehensive view of the global bioadhesive market. Porter’s Five Forces model for the bioadhesive market has also been included to help understand the competitive landscape in the market. The study encompasses market attractiveness analysis, wherein end-users are benchmarked based on their market size, growth rate, and general attractiveness. The study provides a decisive view of the global bioadhesive market by segmenting it in terms of end-users such as paper & packaging, construction, wood works & furniture, medical, personal care and others (including textile, foundry). These segments have been analyzed based on present and future trends. Regional segmentation includes current and forecast demand for bioadhesive in North America, Europe, Asia Pacific, Latin America, and Middle East & Africa. The report provides the actual market size of bioadhesive for 2015 and estimated market size for 2016 with forecast for the next eight years. The global market size of bioadhesive has been provided in terms of volume and revenue. Market volume has been defined in kilo tons, while market revenue is in US$ Mn. Market numbers have been estimated based on key end-users of bioadhesive. Market size and forecast for numerous end-users have been provided in terms of global, regional, and country level markets. Secondary research sources that are typically referred to include, but are not limited to company websites, annual reports, financial reports, broker reports, investor presentations, SEC filings, internal and external proprietary databases, and relevant patent and regulatory databases such as ICIS, Hoover’s, Factiva and Bloomberg, national government documents, statistical databases, trade journals, market reports, news articles, press releases, and webcasts specific to companies operating in the market. The report comprises profiles of major companies operating in the global bioadhesive market. Key players in the bioadhesive market are Ecosynthetix Inc., SCION, Cryolife, Ashland, Henkel AG & Company KGaA, Meredian Holdings Group Inc., Bio Adhesive Alliance Inc., Adhbio, Adhesives Research, Inc. and 3M Company. Market players have been profiled in terms of attributes such as company overview, financial overview, business strategies SWOT analysis, and recent developments.